While the quick-firing batteries of the pre-dreadnought were eliminated with the arrival of Dreadnought, the secondary gun was not dead. Torpedo boats remained a threat, and one that could not be countered by the main guns, because they trained and fired too slowly. Dreadnought herself had a light secondary armament, 27 single 12-pounder (3") guns, designed around the threat of independent attack by torpedo boats at night. This meant that the guns would not have to be manned during a fleet action, when the main guns were firing, and thus did not need armor. In fact, it was thought that widely dispersing them would provide greater protection than grouping them and providing light armor. However, they did need to be handy, quick-firing, and have positions with wide arcs of fire. 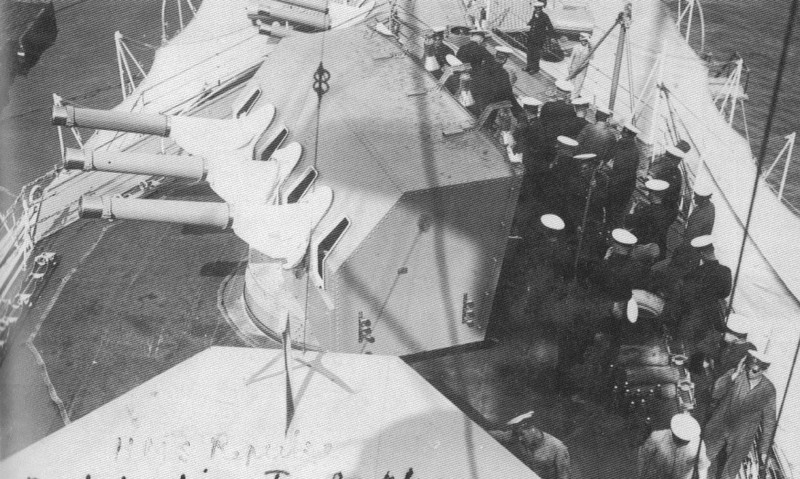 As such, guns were mounted in the open on the main deck and on top of the turrets. Both positions had drawbacks. The ones on the main deck were vulnerable to damage from gun blast when the main guns were fired, and some of them were made to retract into the deck, while the turret-top guns couldn't easily be supplied with ammunition. Guns at night were useless without searchlights, which had problems of their own. After Dreadnought was laid down, the need for an increasingly powerful secondary armament became apparent. A trial with the destroyer Skate showed that the 3" was only marginally effective, but that the 4" shell was very potent. 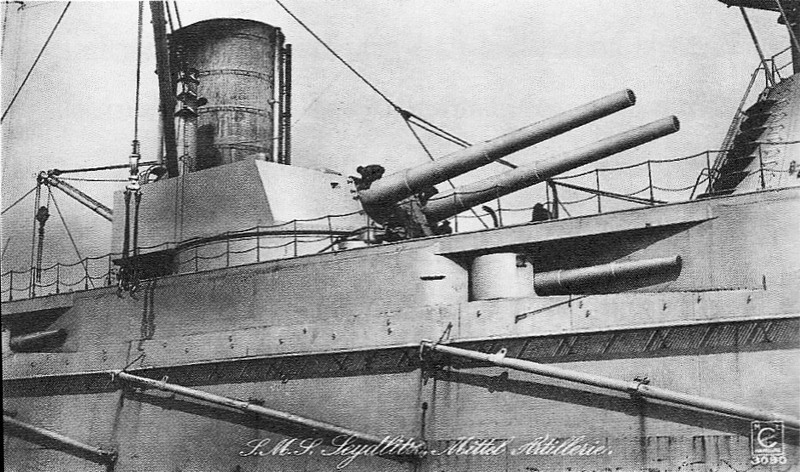 The increasing range of torpedoes also meant that a longer-range weapon was necessary, and the follow-on Invincible and Bellerophon classes had 4"/50 guns. However, the fundamental assumptions behind the layout remained the same, and the guns remained exposed until the King George V class five years later. 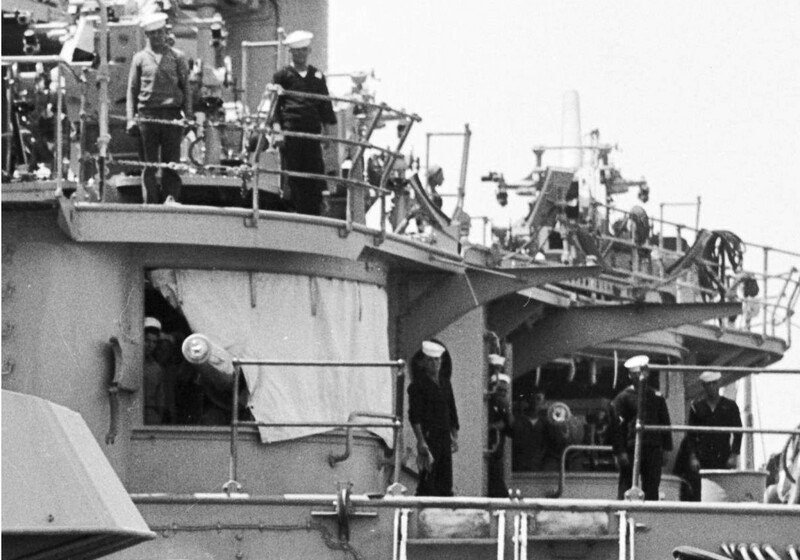 On these ships, some of the 4" guns were moved into the superstructure, behind light armor plating, due to the realization that German destroyer doctrine was very different from their own. The Germans had long focused on combat in the North Sea, where bad visibility was expected to keep combat ranges short. This meant that the torpedo was expected to be a viable weapon in most battles, and the Germans planned to keep their torpedo boats with their fleet even during a daylight action. This meant that the British would need to man their secondary guns during a fleet action, requiring armor and positions that were reasonably safe from the blast of the main guns. This philosophical difference also showed up in the secondary armament of the German dreadnoughts. They were alone in retaining the 5.9" gun in their first dreadnought class, the Nassaus, and used them on all subsequent dreadnoughts. At least initially, this was in large part because the Germans did not fully accept the philosophical underpinnings of the dreadnought. They believed that at the short ranges they expected to fight at, the QF gun remained a valuable weapon against other capital ships, as it had during the pre-dreadnought era. The British believed that they were specifically mounted to strip away the secondary weapons of the opposing fleet, opening the way for the destroyers to attack. The fact that these were not true secondary weapons meant that the Germans mounted another secondary battery of 8.8cm guns, also in casemates, to deal with torpedo attacks. This battery persisted through the penultimate completed class of German dreadnaughts, the Konigs. Casemates on USS Utah. Note the sponsoned gun forward. By 1910, torpedo ranges had gotten longer and destroyers had become bigger and tougher, making the 4" gun marginal, while more armor was needed to protect the secondaries during a fleet action. However, adoption of a 6" secondary was held up until the Iron Dukes of the 1911-1912 program by Jackie Fisher, who opposed it, partially due to an association with the pre-dreadnought, and partially due to a belief that the weight could be better used on speed and firepower. 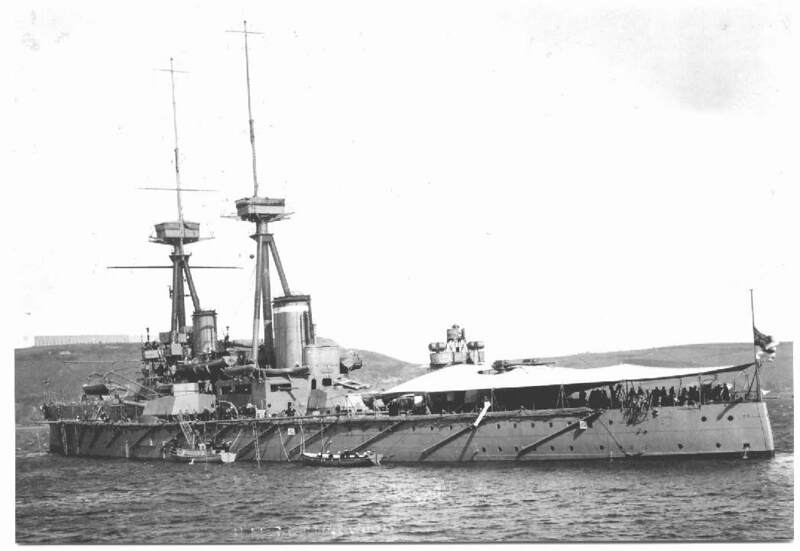 This change accounted for the majority of the 2000-ton increase from the previous King George V class, and the weight of the bigger guns and thick armor meant that the secondary battery now had to be fitted into casemates in the side of the hull, below the main deck, to hold down topweight.1 As with all other casemates, these proved very wet. At Jutland, the secondaries on both sides proved rather ineffective, particularly against other capital ships, and several ships saw the ammunition for their secondary guns go up. HMS Malaya in particular suffered a major cordite fire in her starboard 6" casemate, which killed over 100 men and for a time threatened the survival of the ship. On the other side of the Atlantic, the US was following a model similar to the British, with the first American dreadnoughts of the South Carolina class having 3" secondaries, and the next class, the Delawares, had casemate-mounted 5"/50s. 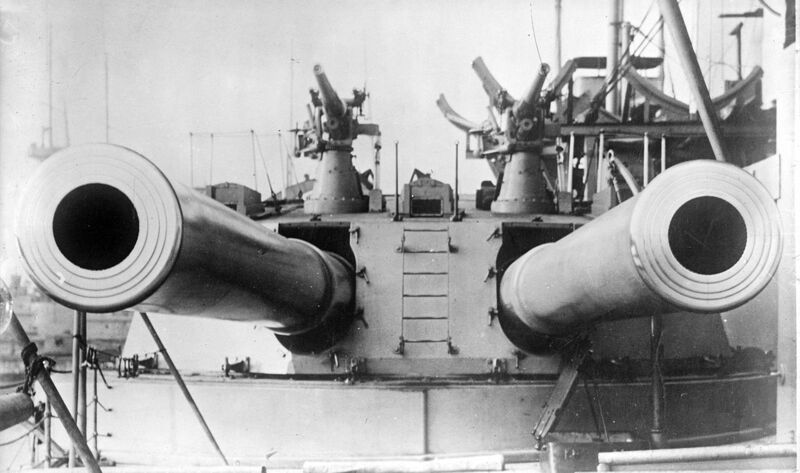 These were followed by improved 5"/51 guns in the follow-on Florida class, and this weapon was used in all subsequent American dreadnoughts until the building holiday in the 1920s.3 This was a powerful and high-velocity weapon, with a flat enough trajectory that it had a danger space longer than the range out to 3000 yards. However, the US investigated a much more radical solution for the Pennsylvania class, eliminating the secondary battery entirely and putting the weight into improved underwater protection, under the theory that the destroyer would always get through, and it was best to simply be prepared to deal with the results. 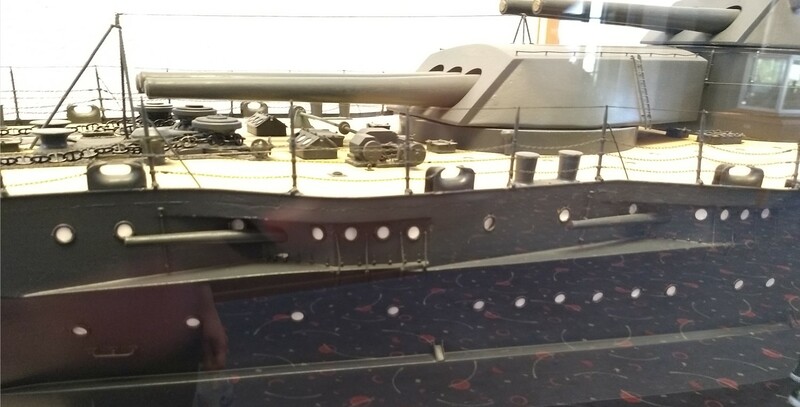 As battleships continued to grow, it became increasingly obvious that the secondary guns would need to be mounted higher to allow them to be fought in rough seas. Casemates also compromised survivability, as openings in the side of the hull would let water into the ship before it reached the main deck if the ship began to sink. The US was an early adopter, moving many of the secondaries on the New Mexico class into the superstructure. These were still in casemate-style mountings, which limited elevation, and as the range of torpedoes was still increasing, other types of mounts were needed. When WWI broke out, Jackie Fisher returned to the Admiralty, bringing with him his dislike of the 6" gun. Two new classes of battlecrusiers were ordered, armed with 4" secondaries. Despite the regression in caliber, an important new innovation, the use of multiple-gun mountings, was employed on these ships. 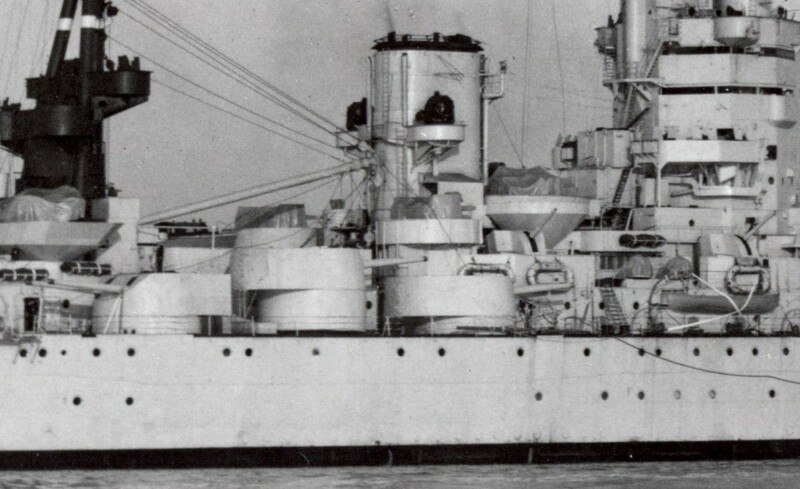 15 of the 17 4" guns on the Renown class were in triple mounts, which allowed much more efficient use of deck space. However, these mounts were not power-driven, rendering them slow to train,4 and required a crew of 32 men each. Worse, the guns were too close together, and the loaders got in each other's way, reducing rate of fire. Because of these drawbacks, HMS Furious, the last ship built under Fisher's program, was armed with single 5.5" guns instead. The same weapons were used on HMS Hood, whose guns were fitted with shields, which, although open-backed, were the forerunners of later secondary mounts with full gunhouses. These two innovations came together in the Nelson class, which had 6" guns mounted in twin fully-enclosed turrets on the upper deck. 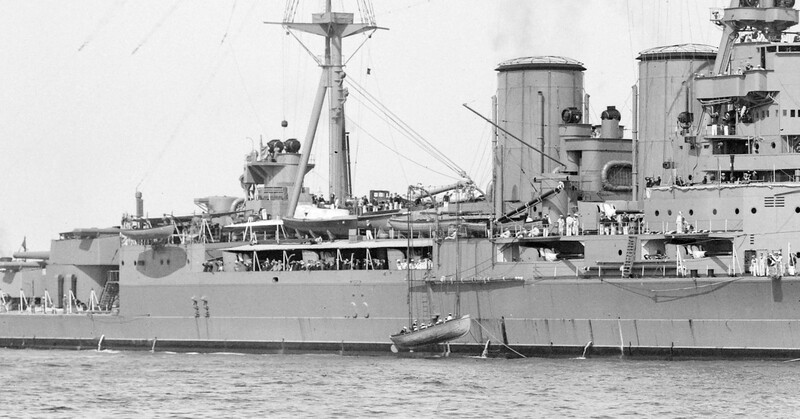 These proved reasonably successful, and most later battleships used full turrets for their secondary armament. One interesting feature was the very high maximum elevation, 60°, intended to give the turrets a secondary anti-air capability. Due to their low elevation and traverse speeds, they were not successful in this role. 6" turrets aboard Nelson. Note the single 4.7" guns at top right. While an attempt to combine anti-surface and anti-air secondary armament on the Nelsons failed, the idea of only having a single secondary battery remained attractive, and when battleship construction resumed, almost all nations chose dual-purpose secondary weapons for their new ships. 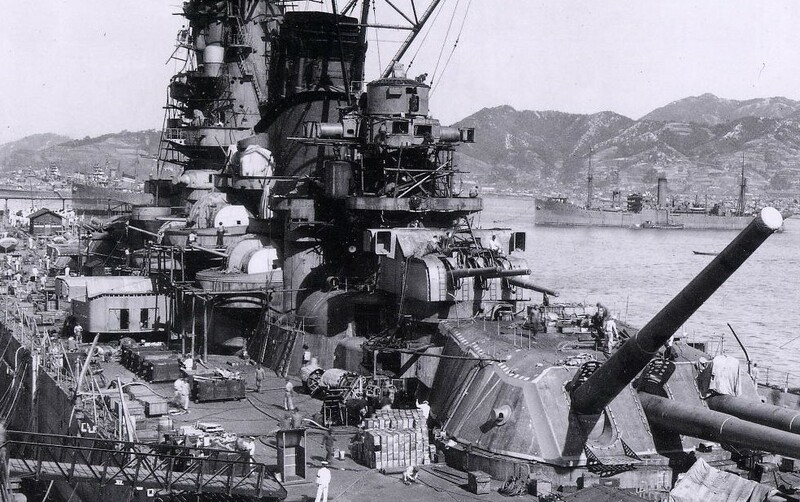 The exceptions were Germany and Japan, who installed 5.9" and 6" weapons respectively. In practice, this choice did not prove particularly successful, as the majority of the ships so armed succumbed to air attack. Next time, we'll take a look at the early development of anti-aircraft weapons aboard battleships, as they went from a few small guns bolted to the deck to an integral part of the design. That's not a bad thought, actually, although the intended use case is very different. Those were offensive, while the weapons here are inherently defensive. If the primary mission of the Iowas is flag-showing, or Tomahawk delivery, or God help us naval gunfire support, then destroyers are a nuisance that will threaten the Iowa as she goes about her mission more than they are a target for Iowa to seek out and engage. So they still count as a secondary defensive weapons. But you're right that it will be a more aggressive, less reactive defense than were the 5"/51 mounts. And from the innate superiority of dual-purpose secondary armament, they should have been VLS Standards or Sea Sparrows. But we didn't quite have those in 1984. And from the innate superiority of dual-purpose secondary armament, they should have been VLS Standards or Sea Sparrows. But we didn’t quite have those in 1984. Standards were never going to happen. Using those effectively requires a lot of radars and other electronics, and finding places for those in a superstructure already crowded with antenna, masts, stacks and directors wasn't really plausible. Sea Sparrow has a lot less impact on the ship, and they tried to fit the non-VLS version, but couldn't find anywhere that was free of muzzle blast for them. The advantage of both Harpoon and Tomahawk is that they don't need huge amounts of electronics to work. Harpoon in particular needs consoles, power, and chilled water. Tomahawk is less tolerant, but still not the systems hog that SAM systems are. Given how much of a constraint muzzle blast was on design, did they experiment with ways to redirect or soften the muzzle blast? It would seem that there are very obvious downsides, because any reduction in muzzle blast probably means a reduction in velocity, but I wonder if you could get something like a muzzle brake that wouldn't have been too disruptive and yet still reduced or redirected the muzzle blast. I'm not sure how that would work. A normal muzzle brake makes the blast problem worse. Instead of all the gas coming out going straight, it comes out to the sides. Maybe you could try to send the blast straight up, but muzzle rise is not nearly as big of a problem for artillery as it is for small arms, and it would probably inversely affect accuracy. Lighter weight barrel extensions are supposedly useful for reducing shotgun noise. Fancy target rifles use bloop tubes to get longer sight radius and, apparently, find the accuracy impact acceptable. This is a confusing one. I suspect part of it is the conservativism inherent in military weapons design. It’s possible to try something like that on a small arm with a simple home machine shop, so the bar for finding out if it works is pretty low. This is not true for a 16″ gun. It’s going to be tricky to design without impacting accuracy (you can’t make the sleeve too big, but it’s going to need to open out a fair bit to not bounce the shell around) and the extra weight on the end is nontrivial. Plus, there’s the fact that the situation with blast only got really bad in WWII when they had to put light AA everywhere. Plus, there’s the fact that the situation with blast only got really bad in WWII when they had to put light AA everywhere. Hadn't blast concerns decades ago killed the en echelon turret layout (which was otherwise appealing enough to get several ships built in it)? I'd think whoever had championed that layout would have looked pretty hard into blast mitigation, though obviously without success. Hadn’t blast concerns decades ago killed the en echelon turret layout (which was otherwise appealing enough to get several ships built in it)? I’d think whoever had championed that layout would have looked pretty hard into blast mitigation, though obviously without success. That's a good point, but the only way I can think of to reduce blast effects is an extender tube. And making the guns longer kind of kills that particular layout, because you need to maneuver them around the superstructure. A 2-A-1 or 2-A-2 would work fairly well.